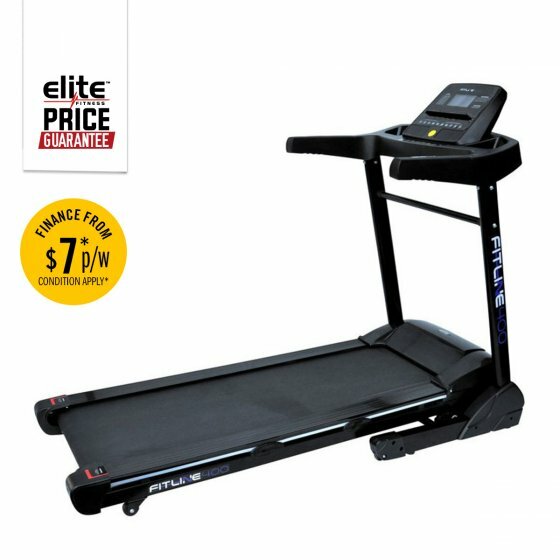 The Elite Fitness Fitline range introduces it's newest product, the Fitline 400 Treadmill. This machine offers features which will keep you active, burn calories and improve your overall fitness. With 18 levels of incline and top speeds of 18km/h, the Fitline 400 Treadmill enables you to change the motion of your workout, increasing intensity to burn more fat. With a maximum weight capacity of 110kg, this treadmill has been designed to challenge you and aspires to push you to reach new fitness goals. A built-in safety drop and quick stop/start buttons ensure that your workout on the Fitline 400 will always be a safe and comfortable one. Do you work out better for music? Ditch your headphones and plug your MP3 into the Fitline 400 speakers! Or if you prefer to watch movies or surf the Web, the built-in tablet holder will keep your electronics secure whilst you exercise. If you are into sprint training or if you are a stay at home mum wanting to get back into shape, the Fitline 400 Treadmill is the best product for you. Easy to use features provide for an effective workout, without the hassle of crowded gyms! Head to an Elite Fitness store today! Backlit LCD Console: Displaying valuable feedback including; Time, Distance, Calories, Speed & Heart Rate. 25 Built-In Programs: Stay motivated using the built-in workout programs. 18 Levels of Automatic Incline Training: To get your heart rate up and burn more calories faster. 18km/h Speed Control: Conveniently located on the handlebars made for easy and quick speed adjustment. Heart Rate Grip Sensors: Instantly check your pulse by placing your hands on the Heart Rate sensors on the handlebars. Shock Resistance Deck: Reduces the force and impact that goes through your joints. Water Bottle Holders x2: Conveniently located on either side of the console. Compatible Music Port for iPod®: Rock your workout to your favourite music! Simply plug in your iPod, iPhone or iPad. Folding Design: Fold it up and wheel away–in one easy step. Transport Wheels: Allows for a convenient way to move the machine between workouts. Built-in Speakers: Get the most out of your favourite songs/podcasts or TV shows while workout.